In an earlier post, I talked about getting the right equipment for your new subwoofer. In this post I will go over a step by step process to hook up your new sub and sound equipment. 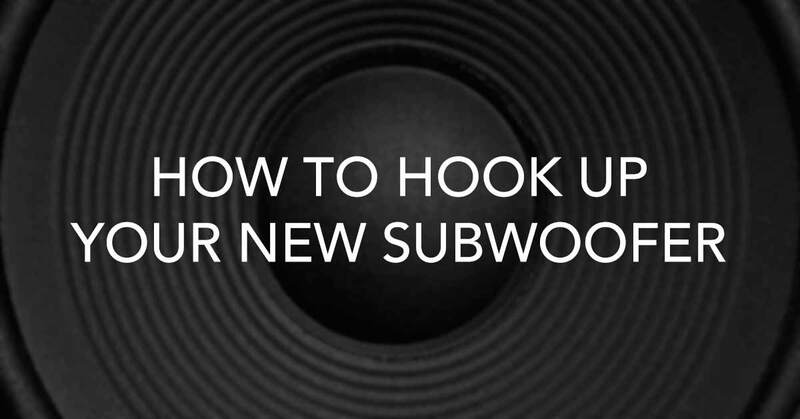 Step 1 – Place your subs in the appropriate place. This can be a bit tricky to figure out, especially if you care about the visual aesthetics of your room. But as a general rule-of-thumb, you do not want to place your subs under the stage, unless you have the appropriate sound proofing system installed within your stage. A stage is usually hallow, so it can easily become a live bass cabinet when subs are placed within it. This may sound like a good idea, because you could get more ‘bass’ out of your sub, but you will also get some great feedback from all the microphones that are on the stage. The location of your sub(s) is not as sensitive as the location of your mains. The low frequencies produced by a sub are non-directional, meaning that no matter where you put the sub, you will be able to hear it about the same. If you can place the sub(s) right under your mains, go for it. However, feel free to try it out in different places before you set them permanently. Step 2 – Connect your subwoofers. The connection sequence for a subwoofer goes like this: soundboard -> amp -> sub. The soundboard -> amp connection is usually with a stage snake. If not, you must use a balanced (microphone) cable with the correct connectors (XLR or TRS only). The ‘amp -> sub’ connection requires at least a 14 gauge speaker cable with a banana plug on one end and speakon connector on the other end. To run your amp in bridge-mono, you can either hardwire or use the banana plug to connect to the two red poles on the back of your amp. If you are using the same output from your sound board that runs to the amp(s) that power your mains, you can disconnect them from your existing amp and plug them into your new subwoofer’s amp. You will then use a short microphone cable to connect the new sub amp to your exiting amp(s), in a ‘daisey-chain’ sequence. Step 3 – Set the amp and crossover. I use and recommend Crown XTi amps, so I will explain how to set up this specific amp. If you have a different amp that has a built in crossover, it will probably be somewhat similar, but you may have to refer to your manual for the specifics. Push the ‘Sel/Enter’ button twice, then use the ‘next/down’ button to find the setting called “BRG Subs” and click the ‘Sel/Enter’ button again. This takes both inputs from your soundboard (if you are running stereo), adds them together and powers your sub in bridge-mono with a lowpass filter at 100Hz. Now, that was easy! However, you can get more advanced by fine tuning your crossover to your subwoofer’s exact specifications, but there is not enough room to cover that in this post. Step 4 – Play some music! Now is time to hear that baby roar! Play a CD and use the volume knobs on the front of your new sub amp to get the perfect mix of the subwoofer with your mains. This is all personal preference stuff, so don’t be afraid to turn those knobs. If you have any questions, feel free to drop and comment and I will get them answered as quick as I can.